Gujarat University Amphitheatre, Ahmedabad, India. The poetry of the Bhaktas, the Sufis and Bauls harnesses the power of surrender and resistance at the same time, speaking of love and interrogation in the same breath. How does this tradition investigate the notions of gender and identity? 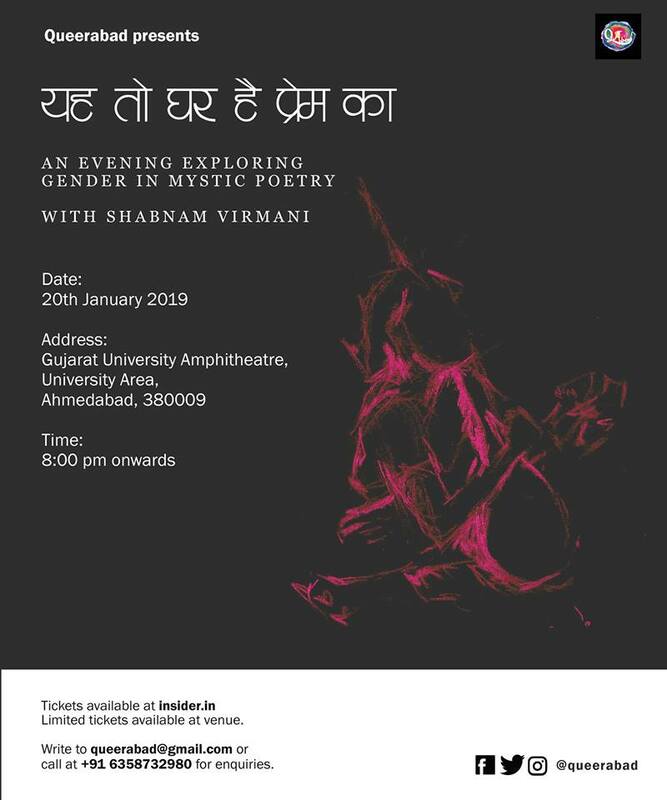 An evening of poetry, songs and conversations with Shabnam. Shabnam Virmani is a filmmaker, singer and artist in residence at the Srishti Institute of Art, Design and Technology in Bangalore. Stung by the religious riots of Gujarat in 2002, she initiated the Kabir Project journeys in quest of the 15th century mystic Kabir, exploring how his poetry intersects with ideas of identity, religion, nationalism, impermanence and orality. Shabnam is currently working on two upcoming books on Shah Abdul Latif Bhitai and Kabir. Inspired by the inclusive spirit of folk music, she took up playing the 5-stringed tambura herself and now performs a wide repertoire of folk songs of Kabir and other mystic poets. *All proceeds go to QueerAbad’s work for the local LGBTQIA+ community and allies.